MediEvil Full Remake- Based on PS1 - UPDATE - Trailer Added! 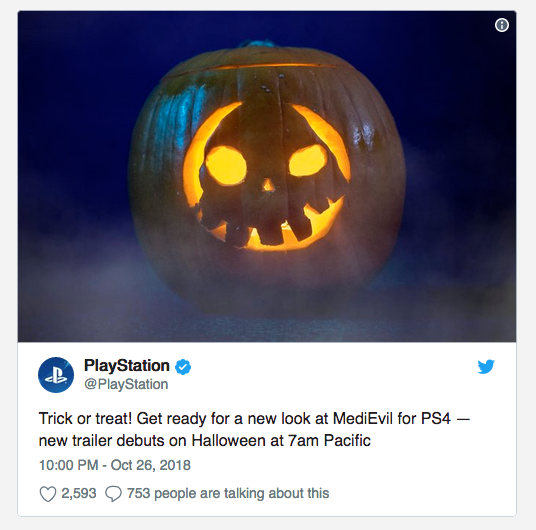 Finally, some news on the upcoming MediEvil game! First of all, Happy ( early ) Halloween! And, it's an actual Remake. Some members of the original team (Guerilla Cambridge) is helping out. The remake is based on the original design and art. Sony is working with Other Ocean Interactive on this project. I really enjoy the MediEvil games on the PS1 so to get a full remake of the original is pretty exciting. Once the trailer is up I will update the thread. Looking forward to seeing more on this, was dead quiet for a while. Cool, I will be getting this. For those that don't know, there already was an earlier remake on the PSP, if you want to check it out in the meantime. Agreed the PSP version is pretty stellar as well. So I’m hoping this new one is somewhat of a new take on the original. Excellent! Honestly though, MediEvil III would be so much cooler. Trailer is up! Visuals look really good tbh, the framerate is a bit off, but the game only comes out in 2019 so still some time to work out the kinks. btw anybody know the code for youtube embedding on this forum? for some strange reason when I use: [YT]............[/YT] or [youtube]............[/youtube] it doesn't work. Re: MediEvil Full Remake- Based on PS1 - UPDATE - Trailer Added! Never played the original, but I'll check it out when it releases. I like these big overhauled remakes. Nothing mentions a physical release ... hopefully that changes. This game looks like some crazy fun. Ah ok, thanks for the heads up URL link it is then. Yeah noticed that too, I'm hoping they do a physical release similar like the Crash remaster.